Healthy gluten-free whole grain and almond flour pancakes your family will love and you feel good about serving. This recipe is our new standard for fluffy Buttermilk Pancakes. Our daughter decided to avoid gluten and sugar for a month to support a friend doing the same. Within the first week, she noticed she didn’t feel fatigued as she had, yet dreading the idea this may be a new way of life for her. 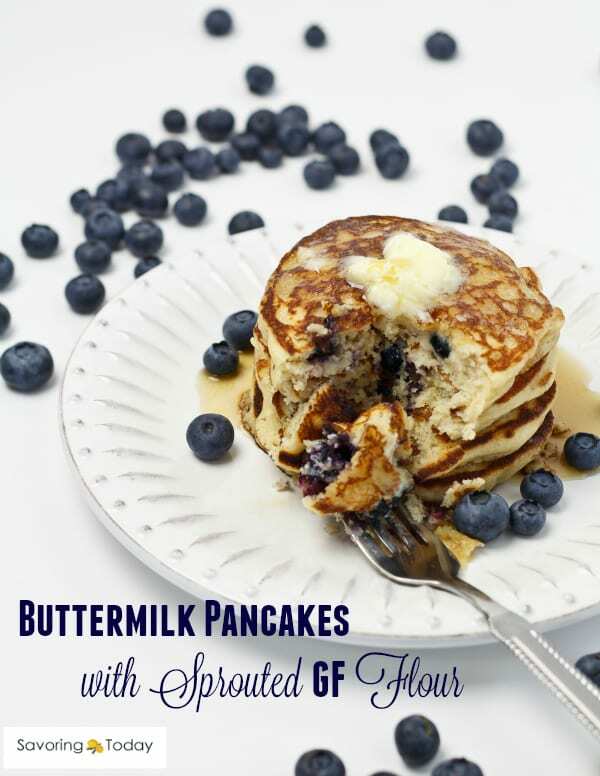 Flipping through an issue of Fine Cooking, Gluten-Free Buttermilk Pancakes caught my attention and since I wanted to support her desire to live healthier, I was set to try them. Folks, they are delicious. Really. Pancakes are my husband’s favorite breakfast food. “It’s cake, in a pan,” He says. Add blueberries and I could use it as leverage to ask for just about anything. 😉 But you know me, it needs to be healthier cake in a pan. Well, the Fine Cooking recipe served as a great start and with a few adjustments to the flours, oil and sugar we found a new standard for Buttermilk Pancakes. What did my pancake man say? Once he got past the “Mmm” was, “Those are the best pancakes I’ve had in a long time, maybe ever.” When our daughter’s friend tried them, she asked, “How is this possible?” Evidently, other bread-type gluten-free products she had eaten for the past two weeks were like bricks. I was happy to find sprouted brown rice flour and sprouted oat flour at Whole Foods to raise the nutritional value—the results were fluffy, crave-worthy pancakes the whole family enjoys and I feel good about serving. Yes, these are whole grain and almond flour pancakes that will rock your breakfast world. Know what else? You can make them ahead and pop them in the freezer for later too! I think you’ll be impressed with how nicely they reheat in the microwave or toaster (even with blueberries) to satisfy your pancake mood on a whim. For more make-ahead meals or breakfast ideas, follow my Make-ahead Meals Board or Breakfast & Brunch Board on Pinterest where we add new ideas almost daily. 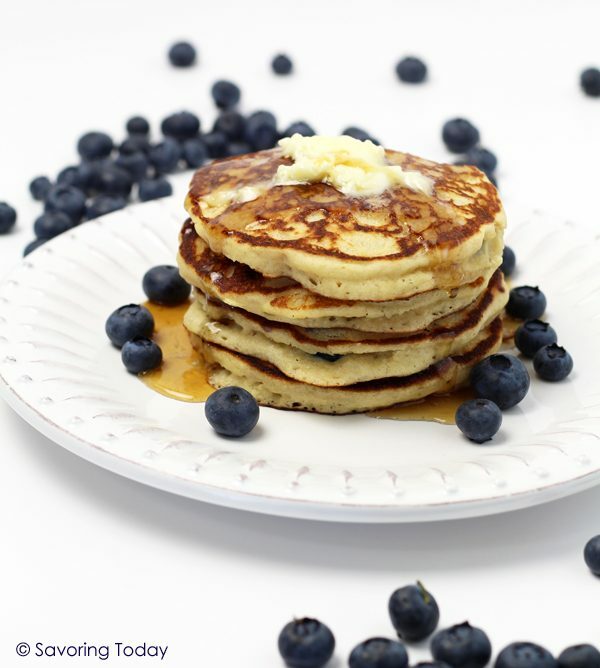 Fluffy, delicious gluten-free pancakes made with sprouted whole grains and almond flour. In a large bowl, whisk the brown rice flour, almond meal, oat flour, cornstarch, baking powder, and salt. In a medium bowl, whisk the buttermilk, eggs, butter, honey, and vanilla. Stir the wet ingredients into the dry ingredients until combined. Coat a griddle or skillet with coconut oil and heat over medium heat until hot. Working in batches, ladle 1/4 cup of the batter per pancake onto the griddle or skillet, leaving a few inches of space between each to allow for spreading. 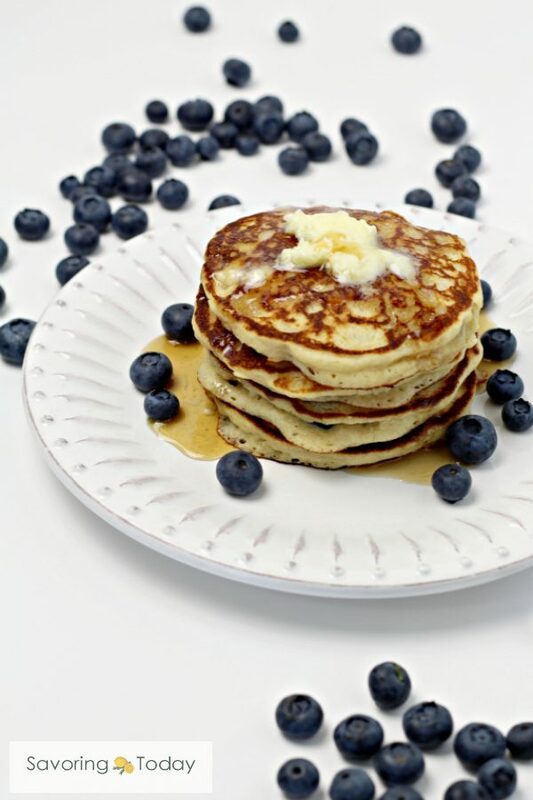 Cook until golden-brown on the bottom, 1 to 2 minutes (if adding blueberries, drop several on top of the pancake before turning). Flip and cook the pancakes until the other side is golden-brown, 1 to 2 minutes more. Serve immediately, or transfer to a cooling rack set over a large baking sheet and keep warm in the oven. Apply more coconut oil between each batch as needed. Serve the pancakes with butter and pure maple syrup. Regular brown rice flour or oat flour can be substituted for the sprouted flours. Note: If the sprouted flour is not available at your local health food store, it is available online. Regular brown rice flour, oat flour, and almond flour is available at most King Soopers (Kroger) stores. Have you figured out the secret to the perfect first pancake? … have you ever noticed how the first two pancakes always seem to be “testers” that don’t quite turn out the rest of them? No matter the batter, it never fails to be that way for me. Good looking pancakes, I think your daughter will be wanting these often. You sure these are gluten-free? They look like some of my favorite blueberry pancakes. Have never used rice flour before, but you just inspired me to give it a go. BTW – Happy Valentine’s Day! Hi Judy, I learned of your blog through Kitchen Riffs. Nothing better than blueberry pancakes in the morning! I keep on hearing about different kinds of flours sold at Whole Foods- I’ll have to stop in there and have a look! Thanks for sharing! These look so light and delicious – thanks for sharing!!! That first pancake can be difficult, can’t it? I have pretty good luck using an electric nonstick griddle, though — and letting it heat sufficiently. I can set it at 350 degrees F, and it stays pretty constant. Anyway, good recipe! And very inventive. Thanks. I used to have an electric skillet/griddle but got rid of it because the only thing I used it for was … pancakes. You are right, it is the ideal way to cook every single one of them perfectly. What a thoughtful daughter you’ve raised, Judy, going GF in support of a friend. Good of you, too, to do your part and come up with this winning stack of pancakes. Who needs gluten when the dish is this good? These pancakes sound great Judy! If you end up continuing with gluten free recipes, you might want to consider trying Authentic Foods brand Superfine Rice Flour. It is available in many Whole Foods locations and they also sell from their own website. I always recommend their flour because it is milled much finer than many other brands, especially the rice flour. If you have tasted a grittiness in commercial gluten free prepared foods, it’s the rice flour. If you would like to see more gluten free recipes that can also be prepared with “regular” flour, I’d love for you to check out my blog! Lovely! I’ll be passing this recipe along to a few friends, we have several that follow a GF diet. I want to make pancakes when we go cottage, but couple friends can’t eat almonds. So is there any substitute to almond meal? These pancakes sound lovely. Although my family are all able to eat gluten, I would love to make these. Not only do they look wonderful, but I am sure the almond meal would make them extra specially delicious! Thank you for sharing them with the Hearth and Soul blog hop. Thanks, April, I had a save-error with this post so I may have accidentally shared this on Hearth and Soul twice, sorry about that if I did. My husband was telling a friend of mine about these pancakes saying, “he was ruined” because other (regular) pancakes he had while traveling for business were not as good. He and I are not gluten intolerant like our daughter (20), but these are my go-to recipe even when she’s not around for breakfast. Let me know how you like them! The pancakes look fantastic! I can’t wait to try this recipe. Two of my children are gluten-intolerant and we have been blessed to have friends who have learned how to prepare gluten-free meals for when she visits. Two of the families have since had children who were told they need to avoid gluten. They felt that they were better prepared since they had already started playing with gluten-free recipes. Thanks for sharing your recipe with the Hearth and Soul Hop. Thanks, they are delicious. Honestly, they are better than any non-GF or soaked wheat pancake I’ve ever had. Hope you and your kids like them. These look great, and I love that these don’t use more than five types of flour! Do you think it’d be ok to omit the almonds or do they play quite an integral role? Thanks for stopping by, I enjoyed browsing your blog too! Those look delicious! I usually make buckwheat pancakes, but I might have to mix it up a little. Can’t wait to try these! I’ve been searching for nearly a year and haven’t found a gluten-free pancake I love yet. Well, I made them again this morning with blueberries–oh, man, just so good. Let me know what you think when you try them. I can’t wait to try them Judy. They look fabulous! Thanks for sharing the recipe. Hi Carmen! Thanks for stopping by and taking time to comment–hope you enjoy this one. You discovered a great recipe. I think I need to lessen my sugar intake. I will try this one. Thanks for sharing. What a great looking stack! I’ve never made gluten-free food before… but this recipe is tempting me to start!